Southern California is known for many things including beautiful beaches and beautiful people. While many come to Hollywood to realize their dreams of becoming the next big movie star, pop star or model and to find the ‘good life’, many of us are content with a peek into the celebrity lifestyle of the rich and famous. Renowned for its many star homes and estates, the Los Angeles areas including the Hollywood Hills, Bel Air and Beverly Hills find many tourists and even the occasional celebrity stalker looking for their favorite stars’ homes with the hope of catching just a glimpse. Evidenced by the many tour companies and map sellers located on various corners, celebrity seeking has become a time-honored tradition and a favorite pastime of tourists and locals alike. Today’s peek into the “lifestyles of the rich and famous” begins at the epicenter of all that magic; the world famous Hollywood Boulevard. Begin your exploration at the Hollywood and Highland Center; a central location that is also a Red Line Metro subway stop. The Hollywood and Highland Center includes approximately 75 shops and restaurants, a movie theater, The Highlands nightclub and a Lucky Strike bowling alley. You could easily spend a whole day shopping and exploring. Connecting to the large retail center is the 3,400 seat Kodak Theatre. Since its opening in 2001, the theater has been the permanent home of the Academy Awards. When it is not occupied by awards preparations and it’s not an Oscar night, a variety of events are scheduled there. Stevie Wonder, Celine Dion, Broadway touring productions, as well as the American Idol finals, Latin Grammy Awards and the American Film Industry Lifetime Achievement Awards have all appeared on the stage. Just announced is the Cirque du Soleil’s 100 million dollar plan to create a Hollywood themed production, opening in 2010, which would make Cirque du Soliel Kodak’s only tenant other than the Academy Awards show. You never know who you might see as you wonder the complex! Also part of the Hollywood and Highland Center is the famous Grauman’s Chinese Theatre that has long been part of Hollywood’s history. When it first opened, over 80 years ago, it was the most impressive opening in motion picture history. Today over four million people a year visit Grauman’s and it is often used for studio premieres. The red carpet is rolled out and fans gather to get autographs and photographs of their favorite celebrities. In 1968, it was declared a historic-cultural landmark and underwent a complete renovation designed to update and enhance the theater. Tours of the theater are offered 7 days a week, or you can opt to buy a ticket to see the film currently playing. Kodak Theatre tours are also available seven days a week with the exception of production and performance times. The courtyard in front of the Chinese theatre and the adjacent sidewalks provide additional interesting entertainment; part of the Hollywood Walk of Fame, which extends from Gower Street to La Brea Avenue on Hollywood Boulevard and from Yucca Street to Sunset Boulevard on Vine Street and honors people who have made a significant contribution in various show business fields. 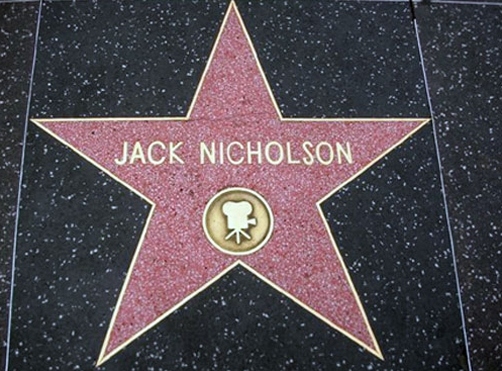 The limited space in front of the theater is reserved for true Hollywood royalty such as Marilyn Monroe and Humphrey Bogart, with 2,500 other available spaces for stars of film, television and radio, directors, singers and song writers and other well known show business celebrities. If you look down on the sidewalk, you will see bronze star shaped plaques embedded in pink and charcoal squares. Inside the star, you will find a symbol showing from which area of show business the person is being honored. The squares in front of Grauman’s are where stars have dipped their hands or feet in cement. Some have even left imprints of their “trademark”, such as Groucho Marx’s cigar, Betty Grable’s legs, John Wayne’s fist, Jimmy Durante’s nose or Whoopi Goldberg’s dreadlocks. The hoof prints from Gene Autry’s horse Champion even occupy one spot. Traditionally, fans place flowers on the star of any celebrity who dies. Each year, fans gather at John Lennon’s star to commemorate the anniversary of his death. More recent stars have gone to Susan St. James, Christina Aguilera, Red Hot Chili Peppers, Ricky Martin, Matt Damon, Jaime Foxx and the Munchkins from the “Wizard of Oz.”. About a week before a new star is unveiled the Hollywood Chamber of Commerce announces the details, creating an opportunity for the “star struck” to attend. In 1978, the Walk of Fame also became a historic-cultural Landmark. At the edge of the sidewalk, starting around noon, there are a variety of superheroes, villains, and movie characters dressed in costume, waiting to entertain tourists. Sponge Bob, Darth Vader, Spiderman, and Charlie Chaplin are just some of the costumes donned by a bevy of street performers. Tourists enjoy taking photographs with the characters who will gladly comply, anticipating a tip, for they are not officially sanctioned by any organization. Many characters are out of work actors waiting for their next job. They add to the buzz of an already crowded sidewalk. After browsing the Walk of Fame, it’s time get for a glimpse of where the stars call home- so board the Starline Tours minibus to find out where the celeb’s of today and yesterday live or have lived in the past. Starline Tours is unique in that it uses minibuses with large windows for great sightseeing, enabling them to go into areas off limits to larger buses. Featured in “The Osbournes” and “Speed”, the two hour fully narrated tour is a delightful way to recapture some of the charm of “old” Hollywood. As the bus heads towards some of the most expensive real estate around- the cost of an acre of land in Beverly Hills is about twenty million dollars and Bel-Air is the most expensive land in all of Los Angeles- you’ll cruise down the famous Sunset Strip past infamous locales such as the Whiskey a Go Go, House of Blues, the Magic Castle, the Viper Room and the Beverly Hills Hotel. Our tour guide, Jack, was able to answer every question anyone had and was extremely knowledgeable about Hollywood past and present. As he drove past Brad Pitt’s bachelor pad, now belonging to Sean Penn, and Bon Jovi’s house, he pointed out houses on the hillside that are held up by stilts, worth anywhere between 2 and 40 million dollars including the Greystone Estate where “Rush Hour” and “Batman” were filmed. Highlights are Merv Griffin’s 35 million dollar home that he bought from Steven Spielberg and homes such as those of Ringo Starr, Simon Cowell, and Christina Aguilera’s home (formerly home to the Osbourne family, who are said to often have come out and chatted with the minibus driver and his passengers). Also on the tour are the homes of L’ll Bow Wow, Jackie Chan, Puff Daddy, Leonardo di Caprio, Sir Elton John, Richard Gere, Nicholas Cage, and others. On the return trip, there was an opportunity to see real stars along famous Rodeo Drive, where the rich and famous shop at such stores as Prada, Harry Winston Jewelers, Gucci and Chanel and the Regent Beverly Wilshire Hotel which was featured in the movie “Pretty Woman.” While there is never a guarantee that you will see a star, Starline keeps current on who lives where, and, at the very least, you’ll see some amazing homes. After disembarking the tour bus, continue down Hollywood Boulevard to visit the Hollywood Wax Museum and some of your favorite stars permanently poised to perform and learn how the sculptors and designers create the stunning sets, or head to the 11 galleries of exhibits at Ripley’s Believe It or Not, a museum that is always a favorite of children. Shopping and exploring include the Disney store and El Capitan Theatre, and the Pig N’ Whistle restaurant. After a full day of searching for stars, it’s time to treat yourself to dinner at Hollywood’s famous Roosevelt Hotel. Before heading to Dakota for your meal explore the elegant lobby and see the fabulous memorabilia of Hollywood’s glorious past. Since 1927 the Roosevelt has been the playground of luminaries including Clark Gable, Carole Lombard and Marilyn Monroe and the birthplace of the Academy Awards. When you are finally beginning to wear out, it’s time to head back to the complex at Hollywood and Highland and head to the third floor for a view of the Hollywood Hills and the famous Hollywood sign. As you head home from Hollywood Boulevard, be sure to plan to return for an evening, because seeing Hollywood at night, with it’s new emerging image, clubs, restaurants, hotels, and new housing, is well worth another trip. T* tours leave every half hour from in front of Grauman’s Chinese Theatre.